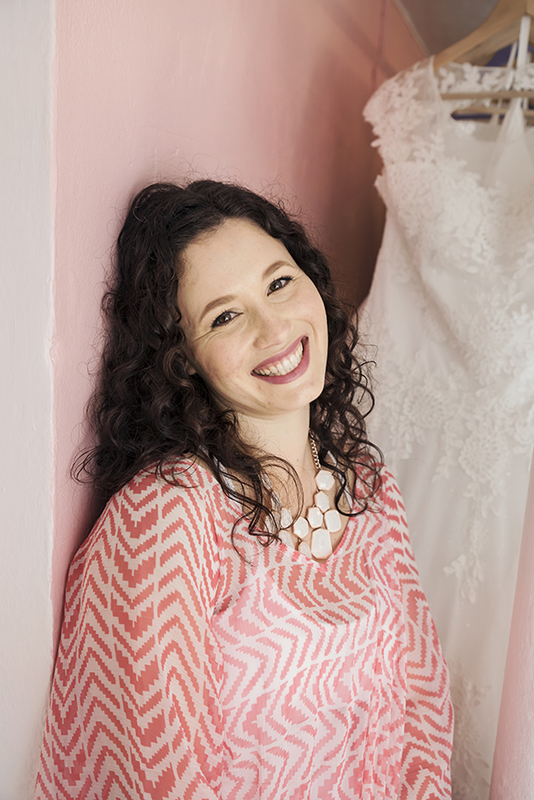 Brides take themselves from shop to shop in search of the perfect wedding dress. The problem comes when falling in love with everything, going with the flow and trying on dress after dress with no real direction or purpose. You will end up feeling overwhelmed, frustrated or just plain over it. Because of this all too familiar scenario, it has become my goal to help brides leave my studio with a sense of direction. This dress journey is meant to be fun, exciting and end with a happy (and sometimes emotional) result. 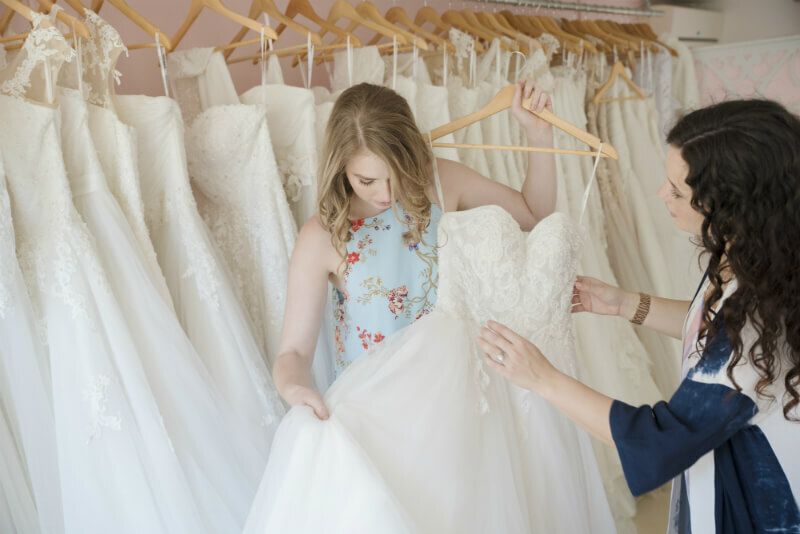 Whether you are about to embark of your own wedding dress journey, or are already well on your way and feeling lost, here are some helpful and practical tips to help you find the one. While shopping at the first store, take this opportunity to either confirm or deny your Pinterest dreams. With each dress you try on, eliminate the riffraff. Try on one of each silhouette or style. If it doesn’t work, then eliminate it. Look at how it makes you feel. Do you feel like a bride? Does it compliment your body shape? Does it suit your personality and wedding style? Once you have eliminated some silhouettes, don’t try them on again. To avoid confusion, keep to the list of styles that suit you. You can apply this process to any style detail such as necklines, fabrics, straps and sleeves, back necklines, lace placement and bodice lengths. Now that you know what type of dress you are looking for, go into each store with a purpose. Ask the sales lady if photos are allowed, if so, only take pictures of dresses that really captivate you. Don’t cutter your gallery with dresses you know you aren’t going to buy. Be bold and admit it when you don’t like a dress, or find it average or that it just isn’t the right one for you. I like to play a game with my brides where we eliminate as we go. Try on dress one, then dress two. Out of these, ask yourself “which is better?” As the appointment progresses the missfits are knocked out. By the end, you should be left with only one or two styles worth considering. You can only get married in one dress, so be ruthless, be honest and go after what you want. So you have found a guy you really like, and he has captivated your heart. He makes you happy and you couldn’t imagine being with anyone else.There are attractive men everywhere, and who doesn’t enjoy the occasional eye candy. Despite the many distractions, you remain committed to your man. I like to look at this analogy as a metaphor when choosing your wedding dress. Don’t fall victim to FOMO. If the dress makes you happy, and you are in love, remain commited and stop looking around. Delete the pictures of dresses 2 and 3 on your phone and stop doubting your choice. Sure, you can appreciate the odd dress pic that pops up on your Pinterest feed, but remember that it is just eye candy. Some questions to help you decide if a dress is in or out. 1. Do I feel beautiful in this dress? 2. Does it suit my figure? 3. Does it go with my wedding venue, décor and overall vision? Have fun, and happy dress shopping. For more tips, visit my Blog page on my site.